Marie Kondo’s KonMari method seems to be taking the world by storm, as people try to declutter their homes and their lives. If you haven’t heard of it, the Konmari method is a decluttering technique first brought to the world through Mari Kondo’s book The Life-Changing Magic of Tidying Up. She now has a wonderful Netlix show as well, called Tidying Up with Marie Kondo. 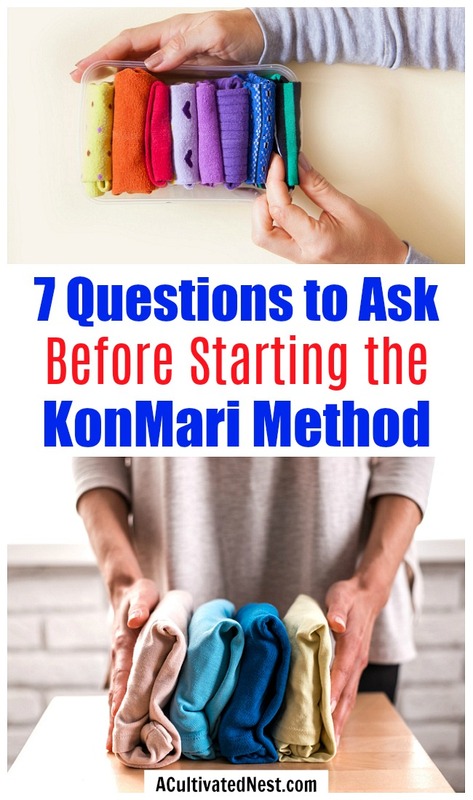 If you’re on the fence about whether or not the KonMari method will work for you, these 7 Questions to Ask Yourself Before Starting the KonMari Method may help! These questions can help you decide if this method will work for you, your clutter situation, and your life goals in general. 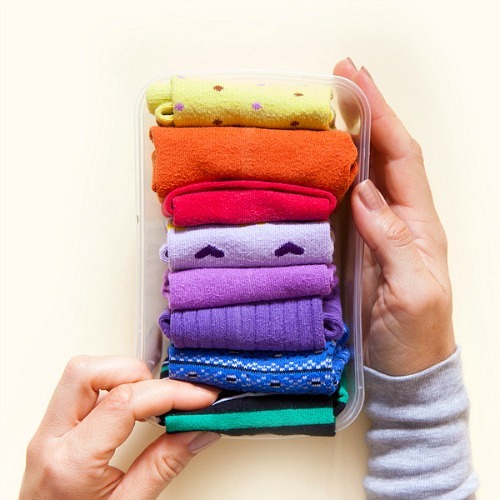 Here is what you need to know before starting the konMari method! 1. Do I have the time to invest in this? Marie Kondo never claims that decluttering is a fast and easy job. She makes it clear that the process will take work and dedication, best done when tackling one category at a time. Instead of tackling rooms, she tackles by categories such as clothes, papers, etc. It may take you several days just to complete one category, but the results are worth it. Do you have the time to invest in this method? In most cases, this won’t be a simple one night project. 2. Do I have a lot of sentimental clutter? Do you own a lot of momentos that mean a lot to you? Do you have a hard time letting things go because of the sentimental value? The KonMari method is sympathetic to this type of person. You don’t need to worry about anyone expecting you to throw everything away or live a minimalist lifestyle. In fact, Marie even shows ways to safely store those special items such as books and photos. 3. Will my family be on board? The KonMari method requires maintenance once your organizing is done. It is important to have a support system that is not only involved in the initial decluttering process but can also help maintain the efforts when the job is done. Will your family be on board, and will they be able to help maintain all of the hard work you are about to put into this program? 4. Am I open to new ideas? Some of the KonMari method ideas are slightly unusual. For example Marie likes to greet the house through meditation before starting, she taps items to “wake them up” before sorting them, and she enjoys rituals such as using sage or incense in a space to help purify it. Being open to these unusual ideas can help you feel much more connected to the process. But be aware these are not mandatory parts of the KonMari method. 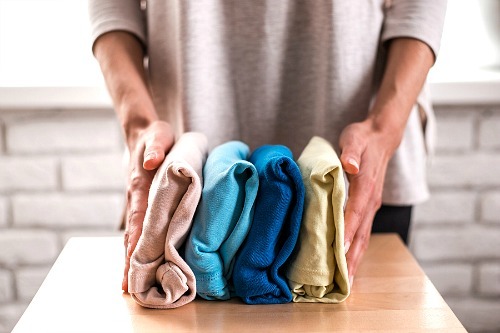 This part of the KonMari method exists because Marie’s methodology is influenced by Shinotism, which values the acts of organizing and cleaning. Some people are uncomfortable with this aspect of Marie’s decluttering method, so choose to ignore the Konmari method altogether. Don’t do this! You don’t have to go by the book when using the KonMari method. If some part of it doesn’t make sense to you or conflicts with your beliefs, feel free to skip that part and just implement the other aspects of the method. 5. Is my issue household cleaning, organizing, or both? One subject Marie Kondo doesn’t tackle is actual cleaning. She will show you how to organize your kitchen, but not how to deep clean it. But if your issue is clutter, she can help you organize. If you are in need of deep cleaning hacks and tips, she doesn’t cover these. The nice thing is, deep cleaning will typically come AFTER the home is organized, so she will help you create the clean slate! Then you can read through our handy cleaning posts for how to get your organized home clean! 6. Am I ready to let go of items that I have owned for a long time? The KonMari process will require you to re-evaluate items and determine your need for them. If you conclude that you haven’t honestly needed or used the item, will you be able to let it go? While the process does allow for sentimental items, learning to let go of unnecessary items is important. 7. Am I on a tight budget? I added this question in because I love the answer: it doesn’t matter! You can borrow Marie Kondo’s book from the library for free, enjoy her website for more free tips, and stream her television show on Netflix for around $7 a month. She doesn’t require that you buy any fancy storage systems, she just requires that you invest your time and energy. Many people are enjoying success using the KonMari method, and when you ask yourself these 7 questions, you might find that the KonMari method is, or even isn’t, a good choice for you! Ask yourself these 7 questions before starting the KonMari method, and see if they can help set you on a path to decluttering the KonMari way! Don’t have the time/energy for the KonMari method, but still want to declutter your home? You should read our ebook Throw it Out! : How to Tame the Mess Monster and Declutter Your Home! You should also check out our list of 100 things to throw away today! A free printable version of the list is available in our free resource library so you can carry the list around with you as you declutter your home the fast way! What do you think of the KonMari method? This is great. I watched her show on Netflix back in January and have been thinking about it ever since, but have not taken the plunge into the KonMarie method yet. While I feel like it may work for my home and my needs, I want to read her book first before I truly decided. I will also take into considerations these points you made. Until then, I will continue to declutter in my usual way, because no matter what I decide, we need less stuff in our house. Good idea! I read her book when it first came out, but I enjoy seeing her in action!